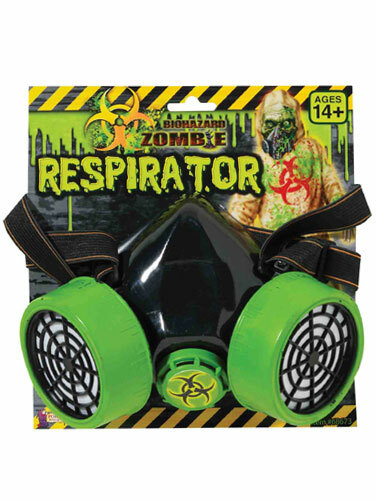 You will look prepared for the zombie apocalypse when you wear this biohazard zombie themed respirator mask. The soft molded black plastic mask is contoured to fit over your nose and mouth. Features two "air filters" with mesh coverings so you can breathe, and a green cap in the center with a biohazard sticker. Adjustable woven nylon strap holds the mask on. One size fits most, ages 14+.